It is always so special to have this site noticed. I love being able to help, and having work get out there to positively impact more people makes me really happy. Today, I received an amazing tweet that made me smile. 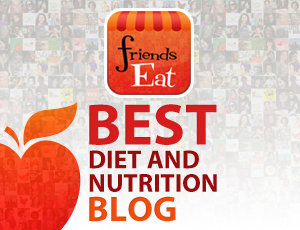 I am Foodista’s Food Blog of the Day! What a wonderful honor to be featured on such an amazing site. They feature so many terrific recipes and beautiful images, so having my cheesecake featured means so much. 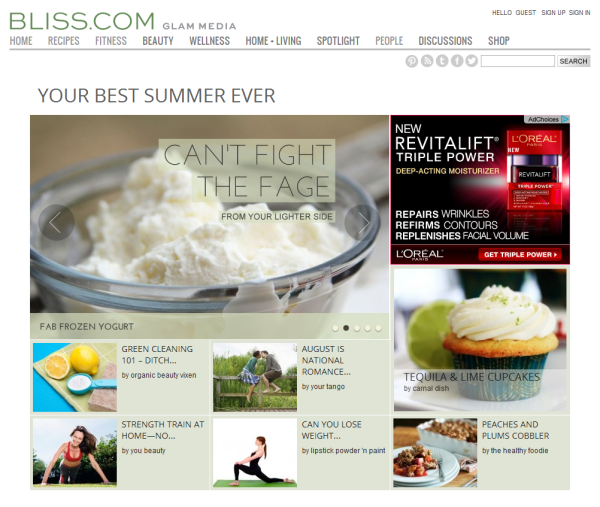 Another boost came from seeing my frozen yogurt recipe featured today on the front page of Bliss.com! What’s more, it’s my picture that I took, which means my efforts with photography are paying off. I am such a fan of Bliss, so it means so much to me to see my work featured. Bliss features some of the most amazing content from around the world and from many sites. To make their front page is a supremely cool distinction. Finally, Hebrew National paid us such an honor yesterday by featuring out party on their Facebook page! Yeah! Party party party! 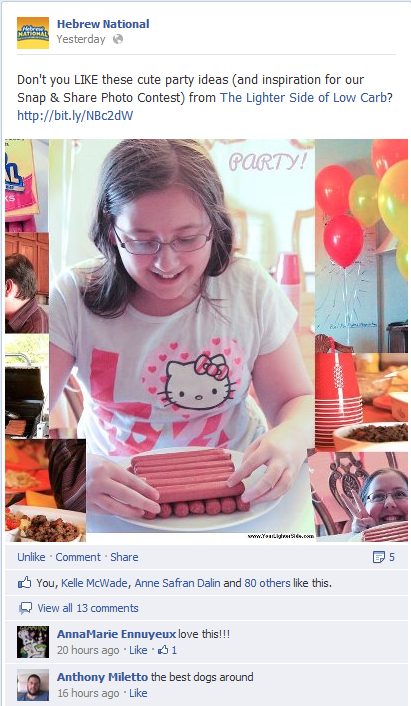 My daughter felt like such a celebrity showing up on their Facebook page. I know she felt supremely snazzy for the entire day over that one. I do what I do because I love you guys so much. Seeing my work branch out into other forums and pages is such a thrill and an honor. Congratz! 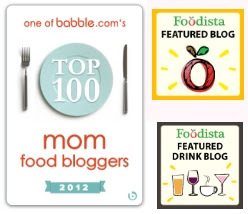 but such a slap in the face you didn’t get something like Foodista’s food blog of the year or at least a Gold Medal. I mean come-on………………. Ha ha! 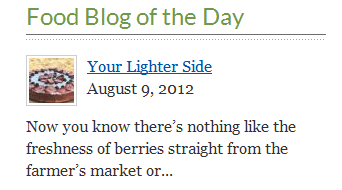 I am so happy to be the Blog of the Day! You, my dear, deserve all the greatest honours and accolades that media can bestow upon you! Smile a smile of greatest personal satisfaction, you have earned it! All the best to you! You are so sweet, Gladys! Thank you for the smile. That is so awesome, Jamie. I rarely comment, occasionally like, but ALWAYS follow the work you at Your Lighter Side. The numerous accolades you receive are truly earned. Thank you so much, Nancy! I so appreciate your positivity and taking the time to say such kind things! That is so great. Congrats to you and all your hard work. I do not comment daily but you can see I do read your blogs, even if I am a couple of days late. Thank you so much, Leona!